Chess originated from the two-player Indian war game, Chatarung, which dates back to 600 A.D. In 1000 A.D, chess spread to Europe by Persian traders. The piece next to the king was called a ferz in Persian, defined as a male counselor to the king. The Europeans concocted a more romantic imagery, and changed the ferz to a queen. At that time, the queen was the weakest piece on the board. The bishop was also a short-range piece. Because the queen and bishop were so weak, the game was much slower than it is today. It took a long time for a player to develop the pieces and even longer to checkmate the enemy king. Medieval chessplayers often started out with midgame starting positions to speed up the game. Medieval chess was extremely popular. Sometimes, a game of chess was used an excuse to allow a young man and woman intimate time alone. At the end of the 15th century, the rules underwent a sudden sea change. The queen transformed from the weakest piece on the board to the strongest! At the same time, the bishop became the long-range piece that it is today. These changes quickened the games pace. The battle was intensified. Mistakes were harshly punished, tabiyas were no longer necessary, and violent checkmates were executed much more often than before. The inventor of these changes is unknown; probably the new rules were not thought up by an individual, but came about from collective experimentation. These new rules were standardized by the 16th century advent of mass production and the printing press. The faster paced game was more suitable for organized play, chess notation, codified rules, and strategy books. American chess was fortuitously trumpeted by founding father and chess aficionado Benjamin Franklin, who in 1750 penned The Morals of Chess.Franklins article praises the social and intellectual development that chess inspires. Franklin himself was known to while many hours away on chess, especially against beautiful women. Paul Morphy, born in 1837 in New Orleans is hailed as the first American chess legend. After winning the 1857 American Chess Congress, Morphy accepted an invitation to Europe to take on the best players in England, France, and Germany. He crushed Adolph Anderssen, who was considered to be Europes leading player. There was no world championship at the time, but Paul Morphy was unofficially acknowledged as the best player of his time. He was the first American to be recognized as the best in a cultural or intellectual field. Paul Morphy quit chess soon after returning from Europe, and attempted to start a law practice. He was unsuccessful, and later went mad, believing that friends and family were out to kill him. He died at 1884 of a stroke while taking his customary midday bath. The first U.S Championship was held in 1845, and the first womens championship was held in 1937. The National Chess Federation, which promoted many of these tournaments, later became the USCF, officially founded in 1939. In 1972 USCF membership doubled due to interest in Bobby Fischer’s rise to the World Championship. Bobby Fischer was born in Brooklyn in 1943, learned the rules at 6 and became the youngest ever U.S Champion in 1957. He played Boris Spassky for the World Championship in 1972 in Reykjavik, Iceland. It was a theatrical match involving scene changes, last minute no-shows and prima-donna-like requests to change the lighting, the height of the toilets, etc. Spassky added little of the aforementioned drama! It is the most celebrated match in chess history, touted as a Cold War intellectual battle. Fischer won the match 12.5-8.5. 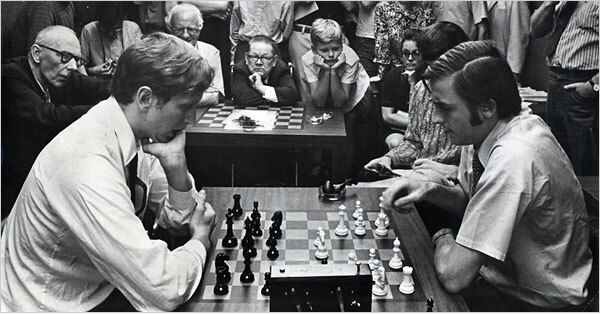 Shortly after, Fischer followed in the footsteps of Morphy and dropped out of chess. He now lives in Iceland. There is a U.S. warrant for his arrest because in1992 he played a $3-million rematch against Spassky in Yugoslavia, violating Washingtons prohibition on American’s doing business there. He is also wanted for tax evasion. Today the USCF organizes, promotes chess around the country, publishes the most widely read chess magazine in the world, Chess Life, and maintains and updates a ratings database for over 100,000 players. U.S. Scholastic chess is booming. Thousands of children compete each year in national scholastic tournaments. The 2005 SuperNationals, held in Nashville, TN, hit a record high of 5230 participants! The most important development in chess in the past decade has been Internet chess and computer technology. There are numerous Internet chess venues such as the ICC and yahoo chess in which amateurs and professionals practice their openings, network and compete for cash prizes and rating points. ChessBase software allows any serious player to access a database of over 2 million games. Before the rounds of major tournaments, players frantically search their opponents games on ChessBase, hoping to determine their opponents chess style or which openings they favor. Press coverage of computer peaked in 1997, when the Deep Blue computer developed by IBM defeated Garry Kasparov. Garry lost by the narrowest of margins, 2.5-3.5, and played well below his standard in the critical game. Still, many consider this match to be the death knell of humansâ€™ chances when playing against computers. The silicon beats are not permitted to play in most international and U.S. championships. The future of American chess is promising. Chess is increasingly covered by mainstream media, and since the game has rarely appeared on U.S. television, there is room for growth here. Another untapped chess market is the female population. Right now only 3-5% of USCF members are women. Raising this number would substantially increase USCF membership and also improve the image of chess. Schools across the country are adopting chess as part of the regular curriculum. The United States Chess Federation, and its presence in www.uschess.org and Chess Life magazine hope to raise the profile of chess all over the country, for every demographic. The Birth of the Chess Queen (2004) by Marilyn Yalom Feminist historian Marilyn Yalom examines the cultural contexts of the queenâ€™s birth and metamorphosis to the strongest piece on the board. Bobby Fischer Profile of a Prodigy (1973) by Frank Brady – Eloquent biography of Bobby Fischer, written by Dr. Frank Brady, a long time American chess supporter and organizer. Bobby Fischer Goes to War (2004) Detailed account of the 1972 match between Fischer and Spassky, written by the best-selling authors of Wittgensteins Poker. U.S Chess Championship 1845-1996 by Andrew Soltis and Gene McCormick- a history of the most prestigious event in America. The History of Chess by H.J.R Murray- A massive tome, first published in 1913 and reprinted at various times over the years. Despite its sometimes-impenetrable density and an old-fashioned writing style, the History of Chess is still considered the seminal chess history text. Even for the layman, it is an amazing book filled with wonderful historical anecdotes and excerpts from texts that are difficult or impossible to find. Unfortunately, it is currently out of print, but you can probably find it at a local library.